The saying goes ‘the only things that are guaranteed in life are death and taxes’. Loss and grief are near universal experiences and there are few of us who have not lost a friend or loved one at some time. In Leeds, and in Britain as a whole, we share many traditions around loss, most of which tend towards the quiet, the understated and the contemplative. We wear black at funerals, put down white lilies and hold moments of silence. There are exceptions of course. At last year’s Hook Lecture, Linda Woodhead talked about how traditions have changed, citing the death of Princess Diana and the very public outpouring of grief as a turning point in the way we remember the dead. As society becomes more secular and the role of the Church less central, so modern funerals have less input from clergy and far more input from relatives than they did in the past, popular music will be played, and poems read at funerals, decorations for graves may include a football scarf for the deceased’s favourite team. And some of our ‘old’ traditions, aren’t actually as old as we think they are. Alan Wilkinson in his classic study, The Church of England and the First World War says “In 1914 public prayer for the dead was uncommon in the Church of England; by the end of the war it had become widespread”. But Grief is still often treated as something that should be kept private, death is seen as an ending and, after a reasonable amount of time, it seems to be expected that the grief associated with that person should also come to an end. We’ve recently been looking at the Mexican tradition of building Ofrendas at the Leeds Church Institute, with the help of Ellie Harrison from The Grief Series and her friend Vlady from Mexico. Ofrendas are memorials, built once a year as part of the Day of the Dead celebrations, to remember those who have died. These large displays include pictures, poems, decorations of marigolds and sugar skulls, and food and drink that the person being remembered used to enjoy. Mexican celebrations, unlike many of our own acts of remembrance, are full of colour and noise. Orange marigolds are everywhere, multi-coloured paper chains hang across streets, mariachi bands play, skulls are painted in bright colours and the whole thing is approached with an attitude that is playful without being disrespectful or dismissive. Some of our group commented on how much healthier this seemed to us compared to our own experiences of quiet, reserved and private mourning. One of the traditions in Mexico is to leave loaves of spicy bread, similar to hot cross buns, but without the dried fruit, on ofrendas and on graves. As families enjoy eating this special once a year bread, so it is believed the visiting souls of the dead can enjoy the essence of the bread that is left for them on the altar, along with various other food and drink that the loved one enjoyed during their life. In this way, families can spend time with and share a meal with their departed (and temporarily returned) loved ones. As we thought about how we could interpret the Day of the Dead celebrations for ourselves and for Leeds we also wondered what the local equivalent of the pan de muerto for a Leeds ofrenda could be. Perhaps a Leeds ofrenda should have Yorkshire puddings or a Greggs Pasty. But as we thought about how we would interpret these celebrations for the city, we also found ourselves discussing what they would mean for us personally. What food and drink did our own departed enjoy? In my own experience, it can often be easier to discuss important things when you have a job to do and ofrenda building serves this purpose well. As families share the act of planning and assembling their ofrenda, they inevitably think, talk and reminisce about their loved ones. Together they will remember happy times that were spent together, what their loved one enjoyed, and how they are going to make them feel welcome. But those discussions and memories will change over time. Each year those ofrendas are rebuilt, and those discussions take place again. Some things will remain the same each time the ofrenda is rebuilt, but some objects will be added, some taken away. Pictures of loved ones may be added to or replaced by others that become more important. Those memories that are import to a child, may not be as important as that child matures. The lives of the people building their ofrendas will not remain static in between because memories are not static. We gain new insights, some things are remembered, other things are forgotten, memories become more or less important as our experiences shape them and we may discover things about our loved ones that we never knew before. 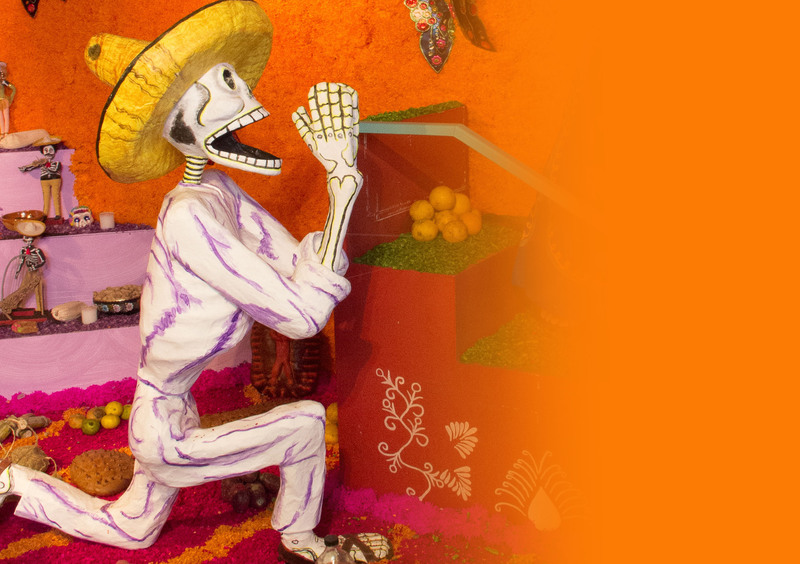 These Mexican traditions reflect the reality that while our loved one’s may be absent, our relationship with them in many ways continues, and in a way that develops and grows as we grow. We continue to remember them, to think of them as we grow and change, and we may even continue talking to them. For the first disciples, the act of sharing bread and wine during the Eucharist may have been a very similar experience to the Mexican Day of the Dead celebrations. For those who had known Jesus personally, the act of sharing bread and wine would have been a way of once again sharing a meal with a departed friend, of remembering and talking together about those memories. The same may happen as we share the Eucharist together, our memories, our understanding and knowledge and our life experience keep changing. Our theology and our relationship with God will be shifting and evolving as we grow and think. At some time the breaking of bread may be a time of celebration of God’s victory over death, but at other times our thoughts may turn towards repentance, sacrifice or loss. To many of us, the idea of souls returning to the living world will be theologically problematic, there are several examples of an ongoing connection with the dead in the New Testament. Paul talks about the great cloud of witnesses, not necessarily as a cloud that witnesses us as much as those that witness to us. So while we may not want to go as far as to suggest that those who have died return to us in the literal sense, the memories and influences of those people can be very much present in our daily lives. The Leeds ofrenda that we have built alongside Ellie and Vlady will continue to develop, and it will be interesting to see how it incorporates Leeds experiences and what we as Leeds folk learn from the experience. For myself, I will try to continue seeing death not as an end to a relationship, but as an ongoing and developing relationship, a switch from a loving in presence to a loving in absence.